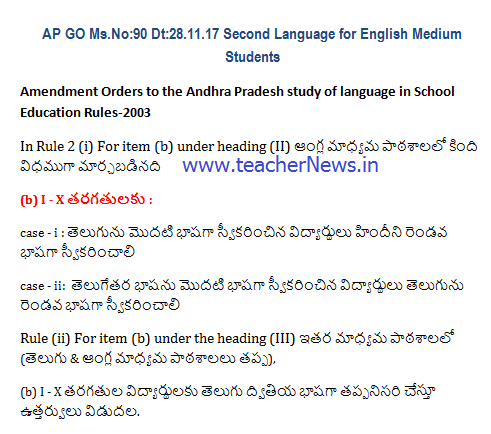 AP GO 90 Second Language for English Medium Students Study of Languages in School Education Rules, 2003 - Amendments G.O.M.S.No.90 dt.28.11.2017G.O.No 90 The Andhra Pradesh Study of Languages in School Education Rules, 2003 – Amendments – Orders. AP G.O.MS.No. 90 Dated: 28-11-2017. Second Language in 10th Class for English Medium Students, Amendment Orders issued. GO 90 Second Language for English Medium and Other Medium Students in AP. Hindi in the case of the students who have taken Telugu as First Language, Telugu in the case of students who have taken other than Telugu as First Language. GO 90 Second Language for English/ Other Medium 1st class to 10th class Students in AP.